After a little more than three months of training, a whole lot of self-discipline, a slight bit of doubt (mostly from other people) and a touch of much-appreciated hype, I ran my first 5K on Saturday. As I wrote in my previous blog post, "On a Mission," I decided in July that I wanted to start running. For pretty much the first time in my life (the torturous, forced runs in ninth-grade gym class do not count). Anymore, it seems the logical goal for non-runners who start running is to do a 5K ... so I picked one and ran with it (hardy har har). When I walked out the door of my grandparents' house (where I was staying for the weekend) on Saturday morning to head to the race, it was cold. Really, really cold. About 35 degrees cold. And it didn't really warm up in the half hour or so leading up to the start of the race, but I was too pumped up about what was to come and too busy greeting lots of old friends who were there to run or walk the race to even notice. 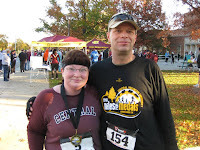 And it was there, at the back of the pack, that I found my friend Don (with me in the picture on the right, which was taken post-run), who signed up for the race after I put out a few calls on Facebook for people to join me. It was reassuring to see a familiar face at the starting line. It also was reassuring to know that at least one other person had NO idea what the guy with the bullhorn was saying (which is what happens when you put yourself at the back of a pack of nearly 450 people). As the "start" signal blared, we wished each other luck (he's been at this longer than I have, so there was no way I was keeping up with him!) and headed out onto the course. Within 30 seconds, there already was trouble. My typically trusty RunKeeper Pro app -- which I've used to track and time all of my runs since I graduated from the C25K app -- did not want to pull in a GPS reading -- a problem that had never occurred before. And we weren't in the middle of nowhere or anything, so there was no reason for the app to fail. Not wanting to waste any more time fumbling with my phone (and having to run slowly to do so), I hit "Start" and focused myself ... until the first alert came on a few minutes later, trying to tell me that I had gone 1.9 kilometers. WRONG! I ignored it and kept going. A few minutes later, it said I had gone 4 kilometers. WRONG again! So I stopped the app. This "technical difficulty" probably sounds like nothing more than an annoyance, but in having to kill the app, I took away my timer and my mechanism for knowing when to take walk breaks. So, I just had to wing it. In a way, it probably worked to my advantage to some extent, because instead of taking my walk breaks based on how far I'd gone, I took them based on how I felt. But because it was so cold and my legs just didn't want to warm up, I ended up taking several more walk breaks than I normally would have. Sometime during the second half of the race, the sun began shining brightly onto the course, and things started to feel a little easier. I even passed some people (one of whom passed me for good shortly thereafter). I was getting warmer, in a good way. And then I turned the corner to begin the final stretch of the race. 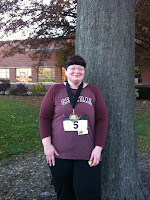 Wanting to finish strong, I transitioned from walk to a pretty fast (for me) run toward the finish line. I felt great ... for a moment. Then I started feeling ... weird (for lack of a better term). 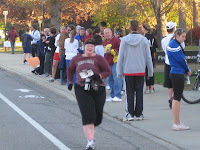 At first I thought maybe I was nervous and excited about crossing the finish line and actually completing my goal. Then I realized something was actually wrong, physically, and I thought I was going to be sick. Not because I was overexerted, but because the sun completely disappeared when I rounded that last corner, and my body temperature must have dropped significantly when that happened. 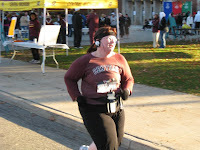 All I could think on my way to the finish line was, "Don't get sick! Don't get sick! Don't get sick!" And then I passed a group of my friends -- several of my former coworkers from my old job -- who had finished the race and were cheering loudly as I ran by. (They're at the far left in the photo on the left.) Let me tell you, few things will motivate you like having a crowd of people erupt into cheers as you run by them. 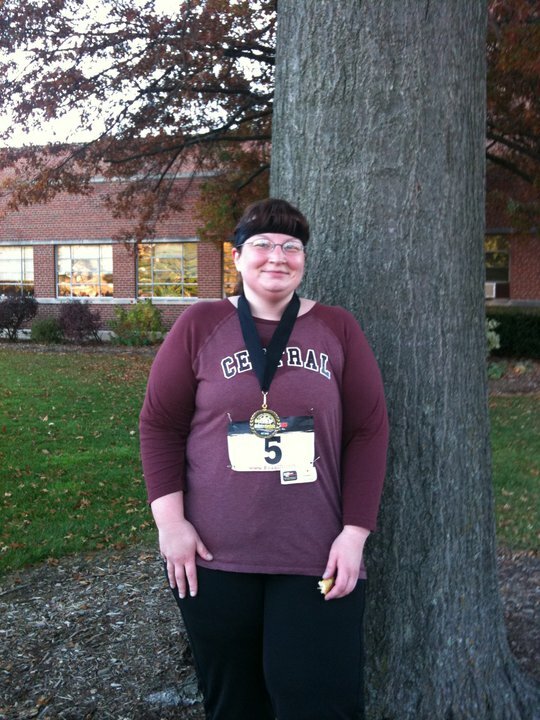 It was just what I needed to make me forget about how my body was feeling and help me surge toward the finish line. As I approached the finish line, I saw two things: First, I saw Tim with his camera -- and I tried not to pay attention to the camera (ha!). Then, I saw the clock (which I think is what was happening in the photo below). Given how challenging the run had been because of the cold, along with the fact that I took more walk breaks than usual, I had expected a time slower than my training runs. Instead, it was almost four minutes faster than my fastest training run. I know I said (okay, probably yelled) something to the volunteers at the finish line, proclaiming it to be my best time ever. Kind of funny, considering that I was the last person who primarily ran the race to finish it (everyone behind me was walking it, I think). Oh, and if you're wondering, my official time was almost 3 minutes faster than the clock time I saw at the finish line (though I'm still not sure why, as we weren't chipped or anything), which means I beat my best training run by more than six minutes! 43:43.6. I'll take it. Thanks to everyone who has supported me through the last several months, from those of you who encouraged me during my training to those who donated to my Special Olympics fundraising. It has made all the difference!